We became aware of a growing desire for 3-way mid-high cabinets, and the demand for a dedicated mid-range horn for this application. After a long search, we found the perfect products: the Sonitus MR8XT and MR8XTN. The MR8XT and MR8XTN are based on the same injection moulded horn with phase plug and back bowl. The MR8XT utilises a ferrite magnet driver and the complete unit weighs 7.8kg. The ferrite version has the added benefit of a larger thermal mass, which helps the driver handle maximum power with more ease. The MR8XTN has a neodymium magnet, which brings the total weight down to a tiny 5.3kg, which helps keep the total cabinet weight down. 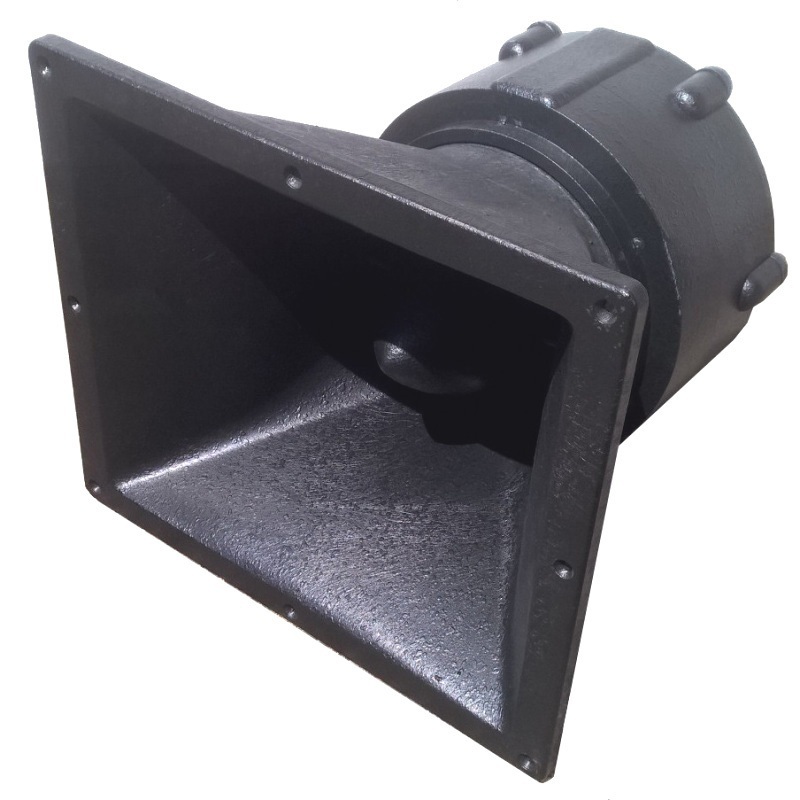 The moulded horn comes complete with phase plug and sealed back chamber, so they’re ready to go straight out of the box, no additional building or modification is required. Since the unit is sealed, it doesn’t need its own mid-range chamber and can share a chamber with a woofer operating in a different band. What’s the point of the horn? The Horn flare boosts the sensitivity of the 8″ driver, the standard 8″ without the horn has sensitivity of approx 98dB 1W/1m which is pretty good for an 8″ driver, but isn’t breaking the laws of physics just yet. 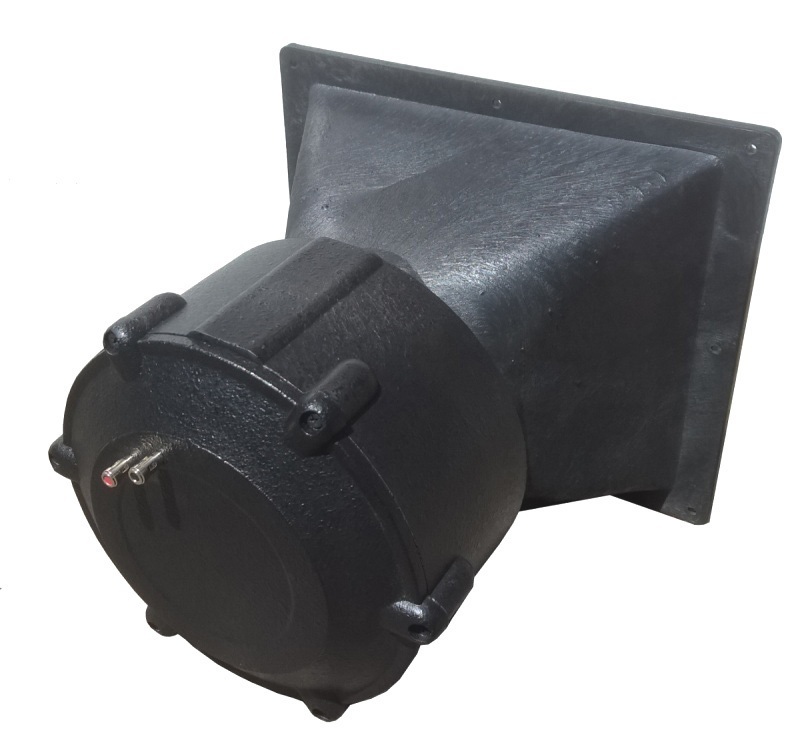 The horn flare and phase plug boost the sensitivity to around 104-105dB, thats an increase of approximately 6dB. The 8″ runs at 150W to achieve the same boost as the horn flare gives just by increasing power to the 8″, you would need a 600W 8″ driver, which a) does not exist and b) if it did exists, probably would be very, very expensive. Alternatively you could use 2-4 drivers instead of one. The horn flare’s main job is improving efficiency, to the point the 8″ is almost as loud as many high frequency compression drivers, and you can use just one 8″ where otherwise you might need 3 or 4. The other function of the horn is dispersion control. In a large format system you don’t want random drivers firing sound in all directions, you end up with a muddy sound, with no clarity and the sound goes everywhere, not just towards the audience. If you control the dispersion, you can focus the sound at the audience, and also have an element of control over where each driver fires the sound, to minimise overlap of separate sound sources, and help create a coherent sound. Things get a little technical here, but don’t worry if you don’t fully understand it. The pictures below will make perfect sense to some people, and hopefully a little sense to novices, and we’ve included some notes to help you get a handle on what this information represents. 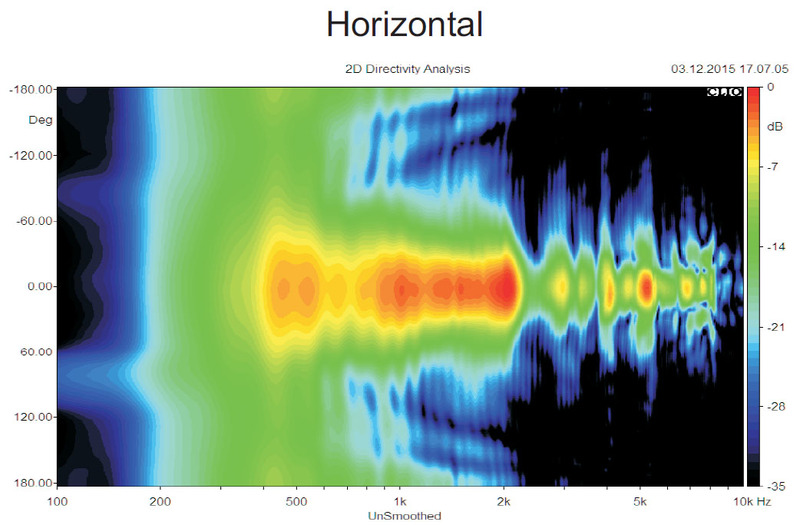 Horizontal dispersion plot. On the left is the angle in degrees, and on the right, the colour coding indicating the volume drop in dB. Along the bottom is the frequency in Hertz. This unit operates best between 400Hz and 2500Hz. 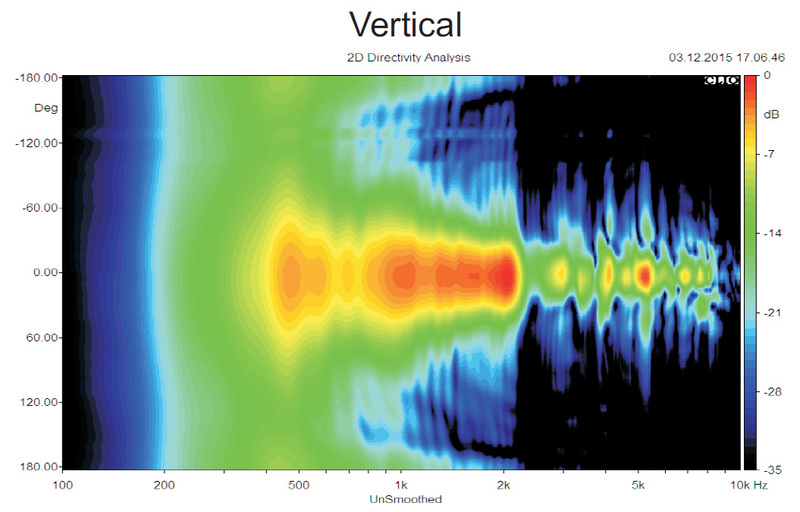 If you look at the response at 500Hz, at 60 degrees off axis, the volume is 7-9dB quieter than on-axis, and the edge of the yellow area is about the limit of the useable operating range of the unit. A little interpretation of the graph shows that the -6dB point is approximately 35-40 degrees off axis, so the majority of the sound is projected forwards up to 40 degrees off the center line. The above is the horizontal measurement, so it’s 40 degrees to the left of centre, and 40 degrees to the right of centre, beyond this point, the sound drops off to lower levels quite quickly. 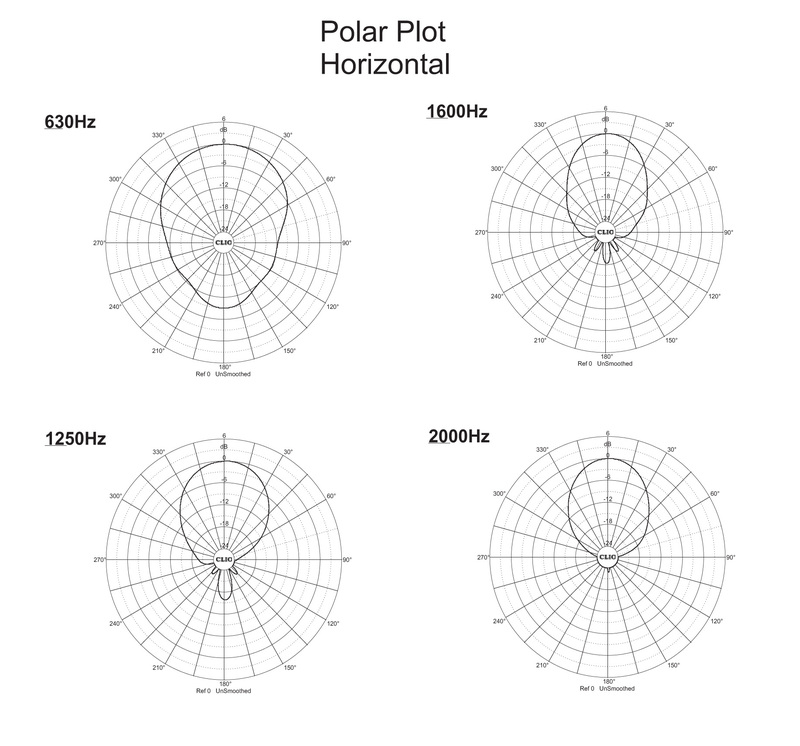 The polar plots show a line of volume 360 degrees around the horn. You can see at lower frequencies (630 Hz) some of the sound goes backwards, but as the frequency increases, the horn is more directional. At 1250 Hz, the -6dB point is approximately 40 degrees and at 1600Hz, the -6dB point is approximately 30 degrees. 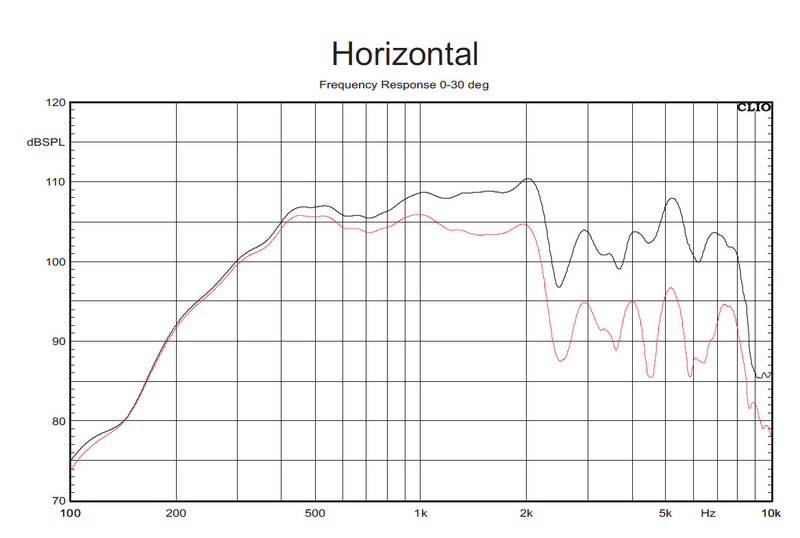 Overall, we are working on the horn being roughly 40 degrees horizontal dispersion for purposes of speaker designs. The dispersion varies with frequency, but a fair approximation is 30 degrees. The vertical plots give similar information to the horizontal plots, but obviously, in the vertical axis. If you’ve understood so far, I’m sure you can figure out the relevance of this. The information is similar, and the horn gives a similar dispersion vertically to horizontally, although subtley different. What’s the Phase plug for? The main job of the phase plug is to prevent cancellation of higher frequency sounds as the travel along the horn. The horn flare sides will reflect sounds produced by the 8″, if these sounds hit each other and are out of phase, they will cancel each other out. The phase plug helps the higher frequency sounds move along the horn without cancelling out, thereby extended the high frequency response of the unit. Without the phase plug, the maximum usable frequency might only be 1000Hz, but with the phase plug, 2500Hz is possible. Why does it need a sealed chamber? The sealed rear chamber does two jobs, firstly it keep bass frequencies out of the mid driver, which means the MR8XT doesnt need its own part of the cabinet. Without the moulded back bowl, bass frequencies from the woofer could interfere with the movement of the 8″ driver, and pressure from the sound waves would modulate and distort the sound from the 8″, which is very undesirable. The moulded back bowl also provides the 8″ with its own small rear chamber, in effect a mini-cabinet of its own. The chamber helps control cone excursion and keeps the sound tight and clean. Why not just use a compression driver? Lots of reasons, and we dont have all day… but we’ll cover this briefly. Most compression drivers that can go down as low as 500Hz – 800Hz struggle at higher frequencies. Most compression drivers ‘honk’ in the critical vocal mid band region, with resonances and distortion evident at higher volumes. Most compression drivers have less that desirable frequency responses in the lower mid region, requiring a lot of additional equalisation to achieve a good result. Paper cones sound smoother than titanium diaphragms. If you achieve a similar SPL with a horn loaded paper cone as a titanium diaphragm you will most likely have less THD, less resonance, and less listening fatigue. 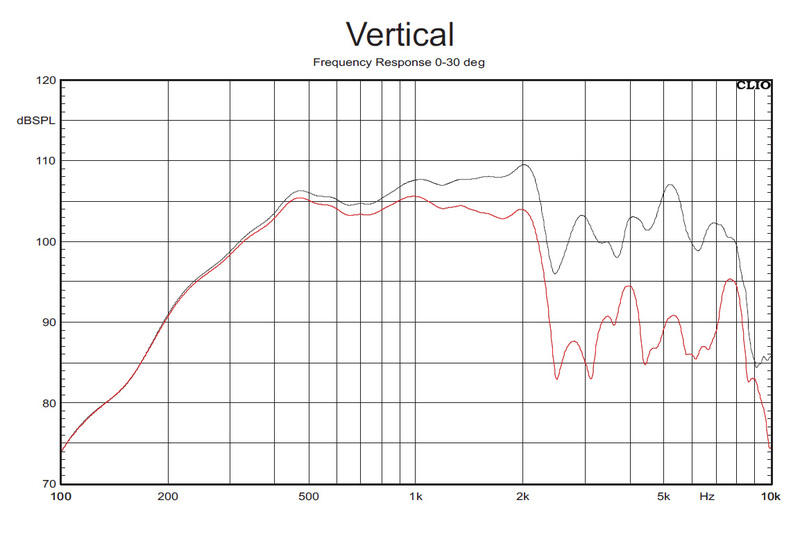 In our tests, the MR8XT at full power was very loud, but didnt ‘hurt’ our ears. An equivalent test with a compression driver trying to cover a similar frequency band at similar volumes resulted in short term tinnitus after relatively short exposure time. Do you need an MR8XT? If you want quality, and clarity – yes, Absolutely!